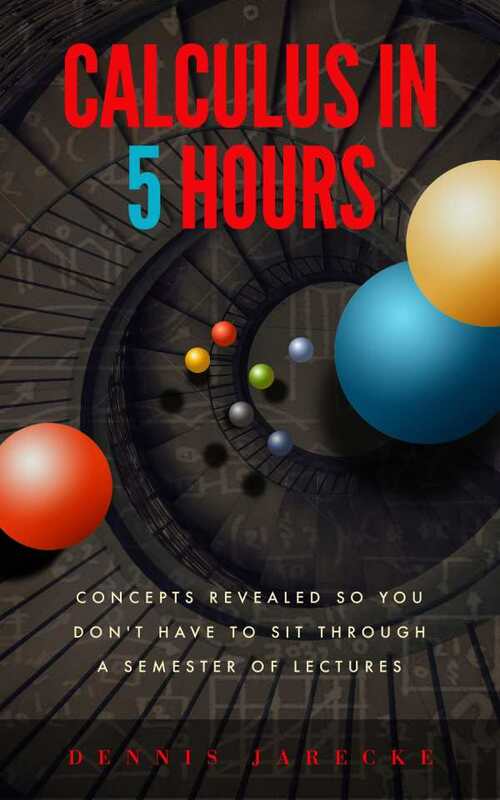 Calculus in Five Hours is an excellent beginner’s guide to first semester calculus. Dennis Jarecke’s succinct version of a first semester, college-level calculus course, Calculus in Five Hours, contains useful tips and tricks for understanding concepts and solving problems. This easy reading self-help book distills complex mathematical concepts into simpler, easier-to-digest bullet points for the mathematically challenged or for those needing a quick review of the subject. The book opens by defining and explaining functions; it progresses quickly and nimbly into the basics of derivatives. Integrals are introduced in the second half of the book. Quick exercises reinforce concepts and bookend each chapter. Complete solutions to problems are provided separately on the book’s accompanying website. Chapters are short, with headings that include the recommended time frame in which each chapter should be completed. More time is required to work through the exercises at the end of each chapter. Those exercises are all solvable—efficient ways to practice and reinforce rules and theorems. Simple graphs illustrate how concepts work, highlight what a function looks like in two-dimensional space, and show how functions relate to everyday situations. The use of real world examples makes the book’s mathematical concepts more concrete—for example, showing how derivatives can be used to calculate rates of change and how acceleration can be calculated by applying the second derivative of a function. Consecutive rectangles are shaded below the lines or curves of a function to demonstrate how integrals approximate the area under the function. These colorful graphs are effective. The weakest part of the book is its first chapter on functions, which spins the topic in more formalized language. This gives the book an initial impression of being overly complicated and academic that is belied by its later, more accessible work. Calculus in Five Hours is an excellent beginner’s guide to first semester calculus, with quick tips and tricks to solve practical problems.